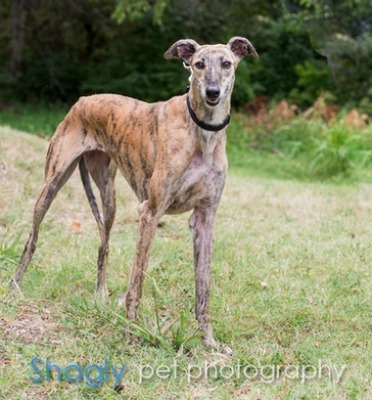 Sasha is a young brindle female who was seized as part of a cruelty case in Tulia, TX along with Prince. She was in very neglected shape when seized - extremely thin with large sores, but has rebounded nicely. She is estimated to be about 2 years old. Sasha has not yet been tested with cats or other small animals. She is a very shy girl and will do best in a home with a canine companion. Sasha came from a very bad situation and she was in rough shape when GALT rescued her. She was severely underweight and cowered from people. After a few months in foster homes, Sasha has blossomed into a sweet, shy girl and is still learning to trust people. 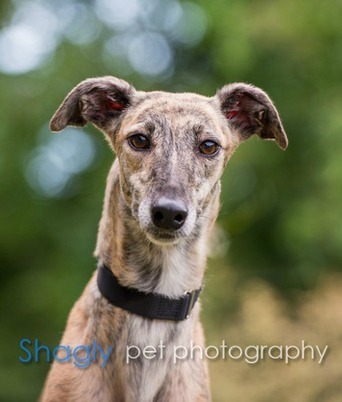 She absolutely lights up when other dogs are around and is still somewhat hesitant, but curious, around new people. Even with those she knows, she is getting more comfortable receiving affection. When we are in the backyard, she runs up and tags one of us in the back of the leg to get our attention. Inside, if the other dogs come up to us, her confidence increases and Sasha will sneak in a kiss. For her to be where she is now is remarkable. Sasha has excellent house manners, loves dog beds, does not try to get on furniture, does not counter surf, rides in the care well, walks well on a leash, sleeps well, hasn't had accidents and above all LOVES to be with other dogs. At Meet and Greets she goes up to other dogs,gets animated and tries to play! She is quite generous and happily shares her bed with her housemates. In the cooler weather, Sasha loves to wear a jacket to stay toasty! She is an adorable little girl and will be a wonderful companion for another dog and a family that will patiently guide her to her full potential.